To view a PDF version of this story, click here. To find links to videos showing how all of these technologies work visit to hardwareretailing.com/globalshop2015. Technology has invaded nearly every aspect of consumers’ lives. Whether watching on-demand TV, browsing headlines on a smartphone or posting to social media from a tablet, consumers have embraced technology as part of everyday life. So why should the in-store experience be any different? 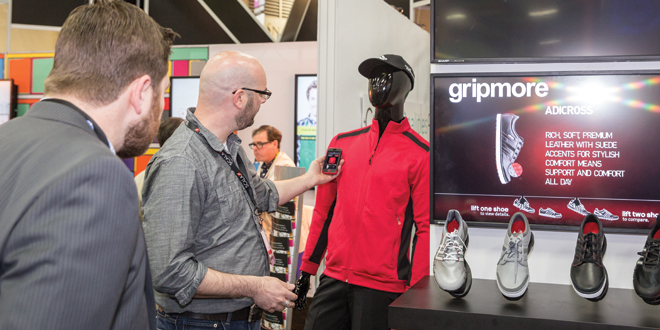 The convergence of technology and in-store merchandising was clearly on display when Hardware Retailing visited Las Vegas for GlobalShop 2015. This article will take a look at 11 ways technology is being implemented in store for a better customer experience. The technology also provides retailers with more information on how their customers shop. 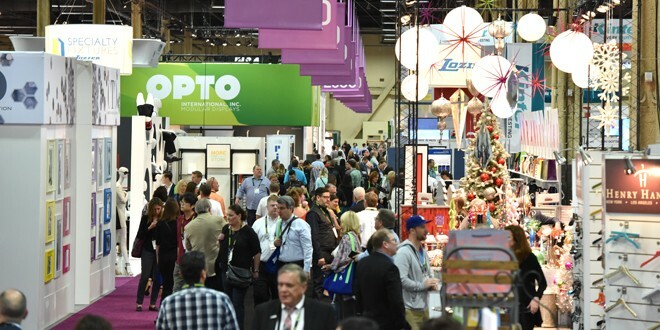 GlobalShop is the world’s largest show for retail design and shopper marketing, featuring more than 700 vendors from all over the world. Attendees are retail designers, store planners, consumer product companies, retailers and architects who are searching for the latest in retail design, shopper marketing, visual merchandising, retail architecture and innovation in the retail environment. The show is split into five sections: Store Fixtures, Visual Merchandising, Store Design and Operations, Digital and At-Retail. This year, an exhibit called “Path to Purchase” was added, featuring 10,000 square feet of space with displays on merging the digital and physical retail space to optimize the in-store consumer path. More than a dozen vendors showcased solutions to create a new shopping experience using smartphones and other technologies customers can and are utilizing in the retail environment to move seamlessly between brick-and-mortar and digital realms within a store. For more information about GlobalShop, visit globalshop.org. Apple’s iBeacon technology was created to enable location awareness for apps. It can notify customers of nearby items that are on sale and enables them to make payments without having to remove their wallets. It also picks up information about customers as they walk through different parts of the store, giving retailers more data on shoppers. 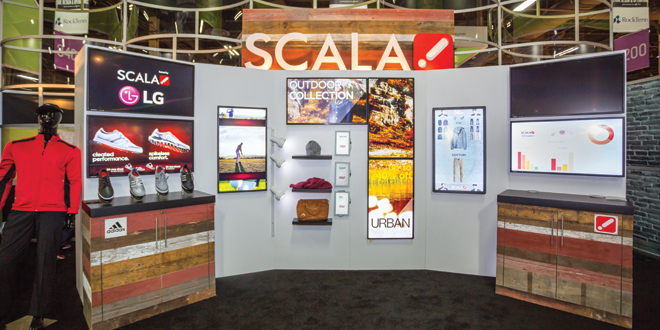 Scala Inc., a digital signage company, showcases several new ways to incorporate digital signage into a retail space. This selling tool gives sales associates the ability to use a tablet to gather additional product information, browse other styles and help shoppers identify products that best fit their needs. Scala Inc. has also created Scala Fling, which gives sales associates the ability to transfer something from the app to a nearby LCD screen for optimal viewing. One of the biggest benefits retailers can gain from incorporating digital is the real-time results this technology can provide. This gives them the ability to make quick decisions based on up-to-the minute information. For example, the image on the left provides a bar graph that shows which shoe was picked up. 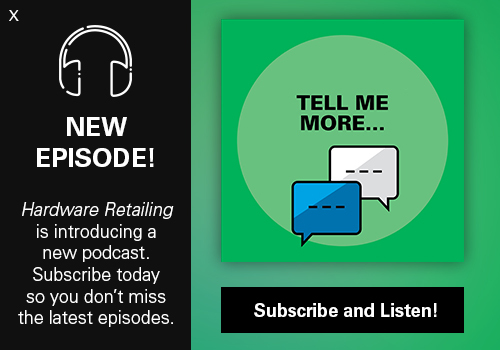 This can help retailers determine if the interaction led to a purchase. There is even a heat map of the store displayed, which uses the iBeacon technology to show retailers where and when most store traffic occurs. This information can be used to determine staffing needs and optimizing planograms. The pie chart shows which items in the store were pushed from mobile devices to the larger screen, letting retailers and sales associates get a better idea of what customers are searching for in their store. 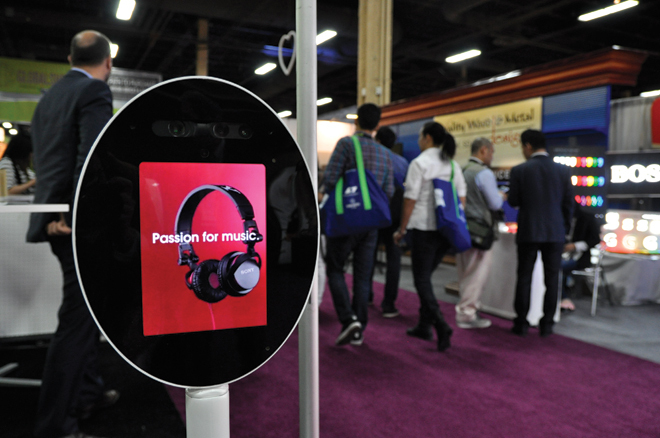 Vertical interactive solutions are also grabbing customers’ attention. The two images above feature Perch Interactive’s vertical display. 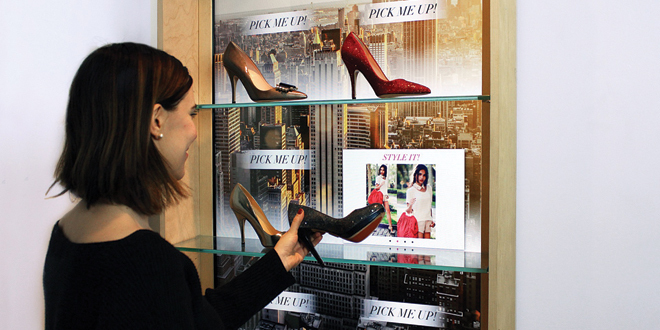 In the above left image, when the customer picks up a shoe, a screen shows how the shoe can be styled. 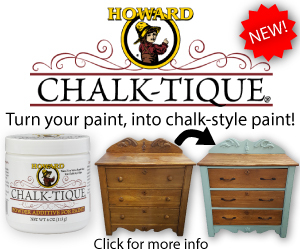 The above right image showcases an entire line of products by using an interactive display. 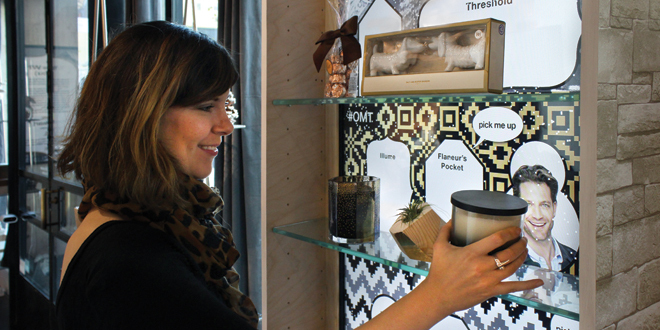 In the photo to the left, Micro Industries has developed a display that allows customers to interact with their Cubes touchscreen app interface. The app lets users take selfies, sign up for newsletters, coupons and circulars or get more information on just about anything the retailer chooses to incorporate. On the back end, everything is run from a simple content management system so retailers can easily manage it. 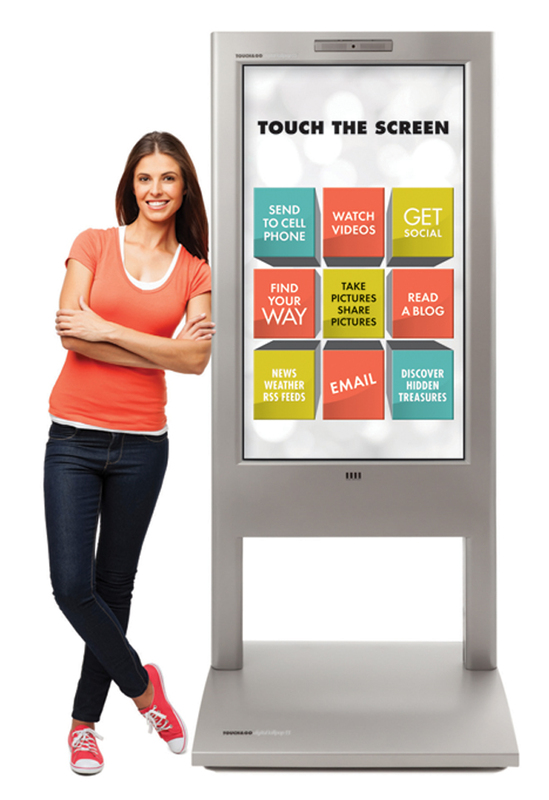 Boost the customer shopping experience by transforming any white table into a customer-activated display. 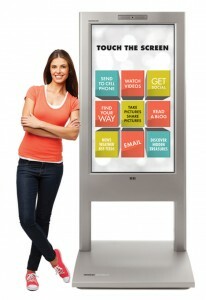 Perch Interactive table displays entice shoppers to interact directly with products. When customers pick up an item, it activates animations that can include videos, as well as product descriptions or comparisons. 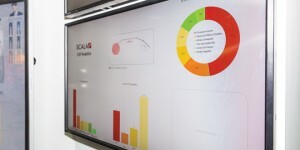 And in coordination with the digital display, retailers receive shopper analytics. Online sales are growing rapidly, but so is in-store pickup. GlobalShop worked with Yunker Industries, Inc., to develop a universal sign for in-store pickup that they hope will spread through all industries. 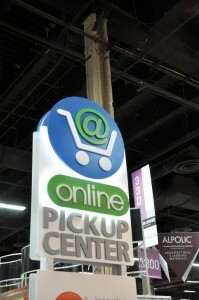 This sign is intended to give customers an icon to help them identify when they can buy products online for in-store pickup and also to help them find where in-store pickup areas are in physical store locations. Also showcased at GlobalShop was an area that featured technology for floor interactivity. GestureTek, a gesture control technology company, developed a box unit, called The Cube™, which can project an interactive diagonal display onto floors or walls. This could provide several in-store uses for retailers. 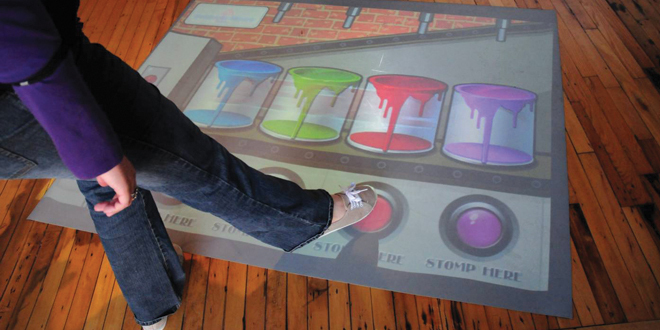 When projected onto the floor, customers can step on the animation to cause reactions. If parents are trying to shop and kids need something to keep them busy, an interactive floor mat can be used as a game that can also promote brands within the store. The example on the left is a project that GestureTek completed for some Benjamin Moore locations. Another use for this technology would be to direct traffic to an area of the store that doesn’t get a lot of customer attention. 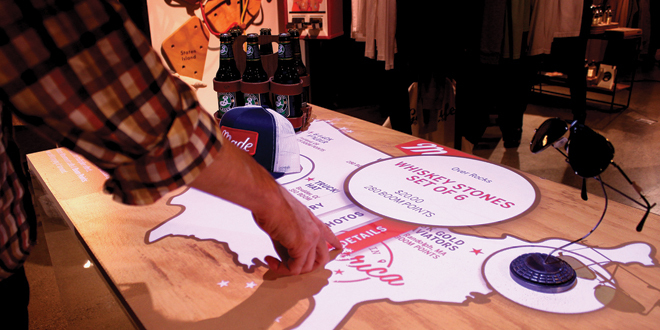 An interactive floormat promoting a brand or sale is sure to drive people in that direction. If retailers don’t want to invest a lot of money into integrating their stores with mobile technology but still want to show their customers they are taking steps in the right direction, these smaller holograms could be a great solution. 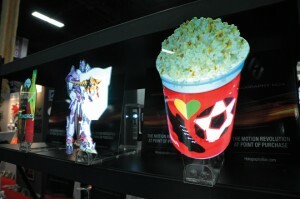 Holography Box adds visual interest to aisle shelves by adding small plastic die cuts that sit between products and use a small projector to show animations. If sales associates are busy helping other customers, Robotbase might have a solution for retailers instead of hiring additional staff. Now you can have a robot that can greet shoppers, answer questions, show product or DIY videos and even guide your customers to an area in the store. It has a built-in webcam that can monitor or connect customers with a sales associate in another location. 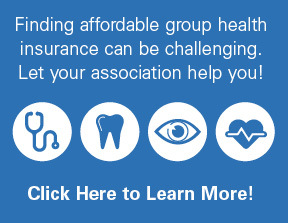 Whitney and her team contribute to the creative development of NRHA and Hardware Retailing magazine’s brand identities, marketing and advertising campaigns, events, websites and print and interactive publications. 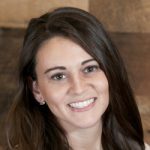 Her team works to provide independent retailers with quality information and tools to help them become better and more profitable. Whitney graduated from Indiana University with a degree in Journalism also focusing in Graphic Design. She recently completed an executive education program at Yale University.